2015 had some of the most incredible art on playa. 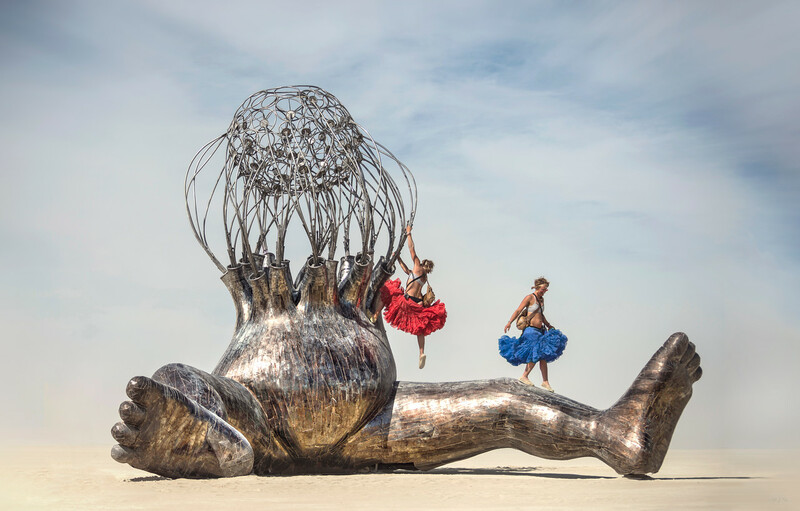 This piece is called Brainchild by Michael Christian out of California. At 21 feet tall and 30 feet wide, I couldn’t imagine what it takes to bring something like this into the middle of the desert and install it securely enough for people to climb all over. I was at the right place and time to capture this tutu’d lady getting her climb on. It was like the perfect symbolism of red, depleted blood going in and oxygen rich, blue blood going out. It’s a rainy day here in North Texas. We’ve been keeping busy with a few product photoshoots. I’m also in the middle of building an add-on of dry storage to my shed. Another thing keeping me busy has been working on my son’s 74 VW baja bug. A good friend of mine is a Volkswagen expert and he’s been getting it road worthy at his shop across town. I’d like to help, but I mostly just hang out and watch. He seems to enjoy the company and we usually wind up in a card game or playing music.